The Ford Mustang Bullitt pays homage to the 1968 movie of the same name, starring the iconic actor and racer Steve McQueen and featuring one of the most famous car chase scenes in cinematic history. Based on the V8-powered Ford Mustang GT, it’s easy to dismiss the Bullitt as a loosely conceived marketing gimmick designed to give the Mustang a mid-life kick-along… but that is selling it short. Very short indeed. How much is the Ford Mustang Bullitt? The manual gearbox-only Bullitt commands a $10,698 premium over the manual Mustang GT upon which it’s based, making it a $73,688 proposition. Just 700 Highland Green examples have been imported, and all have been allocated to dealers around Australia. Out of the box, you get an upgraded version of the Mustang’s 5.0-litre naturally aspirated V8 petrol engine, a six-speed manual gearbox – topped with a movie-mimicking white cue-ball-top gearknob – along with Recaro front buckets in leather, Ford’s Sync 3 multimedia system with Apple CarPlay and Android Auto, a digital dashboard, AEB and more. Fuel-cost wise, Ford says the Bullitt consumes 12.5 litres per 100km on a combined fuel economy cycle… but good luck sticking with that number. A 60-litre tank of 95 octane fuel might get you 480km. I say ‘might’, because keeping the right foot under control is the key here. Who is the Ford Mustang Bullitt for? The Mustang continues to defy sales chart logic, continuing to sell strongly four years after its launch. While the 2018 facelift added a veneer of quality and sophistication, the Bullitt is arguably the most cohesive version the company has made. 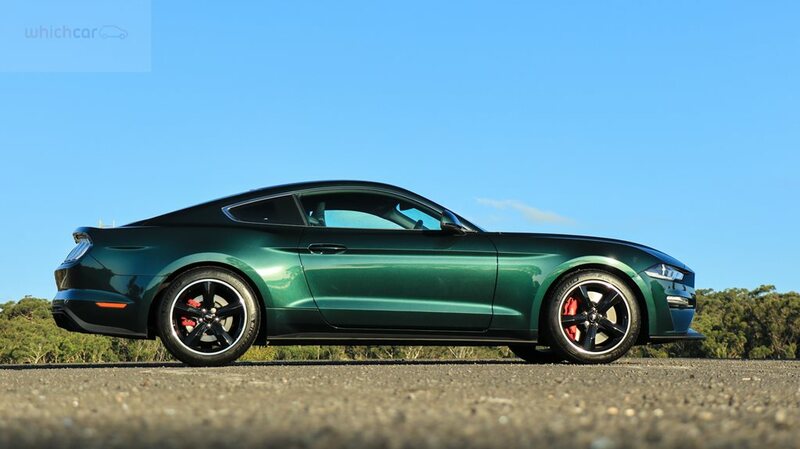 You won’t find a Ford badge on It – even the pony on the grille is missing – and the ‘Bullitt’ rondel on the boot is a bit garish, but the five-spoke 19-inch rims, the dark green hue and the Mustang’s classic yet contemporary coupe swoop combine to present a modern sports car with a suitably subtle retro twist. Movie buffs may like it, but fans of proper V8-powered GT cars will absolutely love it. Is the Ford Mustang Bullitt easy to live with? The Mustang is a two-door coupe slash sports car slash grand tourer, and as such, it’s best suited to two people. Its lamentable rear occupant safety standards and resultant three-star ANCAP score mean it’s not an ideal daily driver for family duties… but from the driver’s seat, it’s a different story. The 2018 upgrades added items like a digital dashboard and improved cabin ergonomics to the mix, and combined with those lovely Recaros, the Bullitt is comfortable and easy to live with. The exhaust system can be electronically altered to be whisper quiet, utterly offensive or somewhere between the two, while the gear shifter and clutch combo are as good as anything I’ve ever driven. The boot isn’t huge, though, the doors are big, the turning circle ain’t great, and the digital dash can be awkward to tweak at times, but on the whole, the new and improved Mustang is easy enough to live with. How well does the Ford Mustang Bullitt drive? The only thing that the Bullitt brings to the Mustang GT is a tiny bit more mumbo thanks to a cool semi-open air filter, intake manifold and ECU tweak, but the way it delivers that 345kW (up six) and 556Nm (up 115) is key to the experience. The long-legged manual gearing means you can hit the national limit in first gear if you wanted to, but that amazing gearbox interface means you’re shifting more often than you’re not. The chassis balance, too, is right on point, thanks to the slightly bulbous 19-inch Michelin tyres on the movie car-mimicking Torq Thrust 19-inch alloys providing ride pliancy that the adaptive dampers can take away. There isn’t a wide range of variance between soft and firm within the damper curve, though; a slightly softer Comfort tune would be welcomed by some. The Bullitt, in essence, makes short work of the longest trips, proving to be both relaxing and invigorating in equal measure. I constantly looked for excuses to drive it, which is a rare experience for this jaded old hack. I flat out loved the Mustang Bullitt. The Mustang per se hasn’t really registered with me as a driving machine up til now – the long gearing and slightly cheap interior bugged me a bit, as did its laisse faire attitude to rear occupant safety. And sure, it’s pretty useless as a family hack, the ten grand ask over and above the GT is a bit rich, and the actual movie itself wasn’t even that good… but peel off the Bullitt badge on the back, and you’ve got yourself a beautifully composed, subtly alluring and highly addictive grand tourer that appeals to both the enthusiast and the everyday driver. Whatever fairy dust Dearborn has blown over the Bullitt has resulted in a rare beauty.